Screening of My Brooklyn (in Spanish) with panel discussion about how development pattern reshape a neighborhood. Organized by the CB7 Housing Committee. 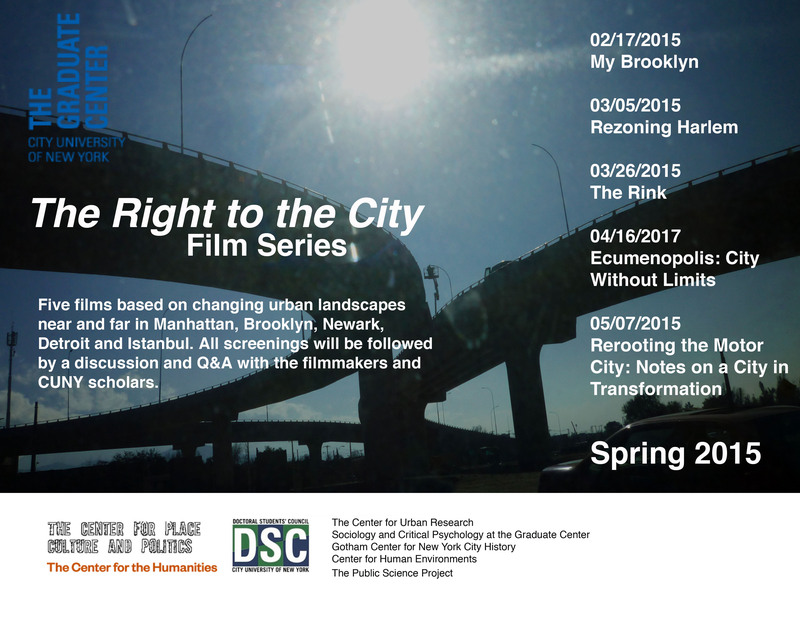 Screening of My Brooklyn, presented by the Department of Urban and Regional Planning. Q&A with Director Kelly Anderson. Screening of My Brooklyn with panel of community leaders to discuss recent development trends in Champaign-Urbana. Dir. Kelly Anderson present. Programmed by Film Streams in collaboration with inCOMMON Community Development. Encore broadcast on PBS World’s America ReFramed! Dir. Kelly Anderson interviewed by Mark Jacobson, contributing editor at New York magazine. How can I organize a screening of this in my area (Boone NC)? Do you work with an organization or school that could sponsor it? We would love to show it at the Full Frame Festival there, but beyond that we don’t have any plans. If you are interested in organizing one please contact me at kelly@mybrooklynmovie.com thanks! FYI- the link to the eventbrite site is broken. I just tried to buy tickets and it won’t let me choose dates or purchase a ticket. That’s because it’s sold out. There are a few tickets sold at the door, so if you want to try that you should get there early. Otherwise, we are planning another week run very soon. I will put you on our email list so you will be notified, ok? I would love to see this film screened in Oakland, CA (where I am living now)! I think that it is relevant to the issues the city is dealing with looking towards the future and I definitely think that there is an audience for a film like this here. There are quite a few independent cinemas that might be interested in showing it. The New Parkway just opened and has shown an interest in hosting community events or one-night film screenings. Also, in my home town of Portland there are theaters such as the Hollywood and Cinema 21 that are community minded and that often screen lesser-seen independent films. Even though there is not the same overt parallel as with Oakland and Brooklyn, there is definitely a community of people in Portland eager to discuss the effects of gentrification. Portland State University might be a great place to look. There are people in the Urban & Public Affairs or Sociology departments who might be interested in organizing an event for your film on campus. Any chance of it coming back to Oakland? I missed it the first time around. Hopefully, yes. I will put you on the list for updates so you will know if something else is planned. Can you also put me on the list for Oakland? Thanks! Anything coming up in chicago?? Will this film be screening in Washington, DC anytime soon? It looks highly relevant to what our city is experiencing. Kelly, are there fees associated with the screening? I would love to host a screening in DC for the Young Leaders in Affordable Housing, but we have a small budget for programming. Is there a screening planned for Vancouver, Canada? If not, I could find out in my University if there is a way they could sponsor it. will there be a screening in chicago or minneapolis any time in near future? I sure hope so! There is a lot of interest from other cities so we are considering putting together a road show of some sort, combining Brooklyn films with local content about gentrification in each city. Will keep you posted. Thanks for the interest. Can you email me at kellyjmanderson@gmail.com and we can discuss? I’m sure we can work something out. Thanks! Any screenings planned for Seattle? Not yet, but we’re hoping! Need an invite. Do you have any requirements/guidelines for your screenings? I work at a small college and would love to see if I could arrange for a screening there. But I was wondering if you have preferences regarding the type of room you’d like used (is a small classroom okay? a student lounge area?) and whether there are any costs involved (sorry if it’s a stupid question, but I never organized a screening before). you can screen as many times as you like, in a classroom or in any other setting. If you are interested in having someone come and speak with the film we would have to discuss an honorarium and covering travel expenses. how can we in Santa Monica, Ca. see it? You can either purchase it for $25 as an individual, or organize a community screening! Let us know which you want to do. you can email me at kelly (at) mybrooklynmovie (dot) com. thanks!